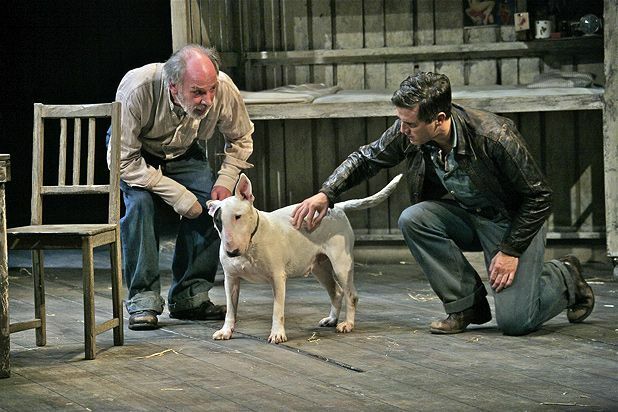 Director John Dove breaks his run of eminently solid productions of Arthur Miller plays at the Lyceum with this solid adaptation of John Steinbeck. And in a similar style to shows like 2010’s The Price, the sets here are towering, intricate and beautiful, providing an evocative backdrop to the action. Below them, the story of nippy farmhand George (William Ash) and his big, simple friend Lennie (Steve Jackson) plays out. The pair are migrant workers, forever forced to move on by the innocent improprieties resulting from Lennie’s feeble-mindedness and forever pursuing the dream of a place of their own where they can live ‘off the fat of the land’. The relationship between the two is tenderly convincing, Jackson putting in a sensitive performance as the babylike, lumbering simpleton who just wants to touch nice, soft things, be they baby mice or girls’ dresses. Some wobbly Southern American accents occasionally detract from the earnestness of the characters’ respective hopes and dreams, making Peter Kelly’s Candy perhaps even more of an oddball than intended, but performances are generally strong. If the emotional impact of the whole piece is slight, the aftertaste left by the conclusion of this sorry tale is quietly shocking.